HTET Result 2019 PGT/TGT/Primary Teacher Examination: Haryana Teacher Eligibility Test is referred to as HTET Result 2019. The official website is www.htetonline.com. The last examination was held on 23rd and 24th December 2018. In this page, we will discuss when the HTET Result 2019 will be announced along with the latest updates on Haryana TET Exam 2017. The Haryana Teacher Eligibility Test (HTET) was conducted into the level of tet examination for the recruitment of teachers at a different level of education. However, the HTET December 2017 exam conducted by the Board Of School Education. Haryana. Bhiwani as Approved By Directorate, Secondary Education, Haryana. (www.schooleducationharyanmgov.in) and also in these guidelines are eligible for the test (HTET) which will be conducted at the following three levels. The TET Exam result 2019 also will be published into three different level. Level -3 (PGT – Lecturer): who intends to be a PGT (Post Graduate Teacher). Level- 2 (TGT Teacher- Class VI To VIII) who intends to be a teacher for classes VI to VIII (TGT — Trained Graduate Teacher). Candidates can check separately the result of HTET TGT 2019 after the result release date. TGT Social Studies, Science, Mathematics, English, Hindi, Sanskrit, Punjabi, Urdu, Physical Education, Home Science, Ats and Music teacher for classes VI to VIII (TGT — Trained Graduate Teacher) will be able to view HTET Result 2019 online. Just after the HTET Result 2019 published candidates may access the PGT result also. (i) English, (ii) Hindi, (iii) Geography, (iv) Political Science (v) Home Science, (vi) Sociology, (vii) Psychology, (viii) Punjabi, (ix) Urdu, (x) History. Not only these but candidates may also check PGT Sanskrit, Biology, Physics, Chemistry, Mathematics, Commerce, Economics, Music, Fine Arts, Physical Education and Computer Science teacher for PGT (Post Graduate Teacher) shall check their HTET exam result online. 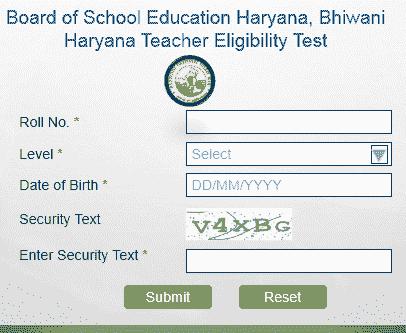 The Haryana Teacher Eligibility Test might have conducted in different dates but the result of HTET will announce Level- 1 (Primary Teacher -Class I To V) or classes I to V (Primary Teacher)on the same day. Those candidates who are declared qualified shall be awarded a Certificate by the Board of School Education Haryana, Bhiwani. Separate Certificate shall be awarded to such candidate who appears and qualifies for more than one level. However, the statement of marks of all the candidates appearing in “HTET” shall be made available on the website of the Board.